The source has a potential to emit of any pollutant or its precursors that is equal to or greater than any threshold shown in Table 4 of District Rule 802. The Control Officer determined that the new or modified stationary source has the potential to cause or contribute to a violation of any ambient air quality standard or increment. The new or modified stationary source has the potential to emit more than 20 pounds per hour of any attainment pollutant or total suspended particulates (particulate matter). An AQIA is necessary as part of the California Environmental Quality Act (CEQA) process. An AQIA can consist of an ambient air quality standard analysis, an increment analysis, or both. See the District’s AQIA Modeling Guidelines for more information. A history of updates to the AQIA Modeling Guidelines is also available. See the District’s Meteorological Data webpage to download meteorological data for use in AERMOD. 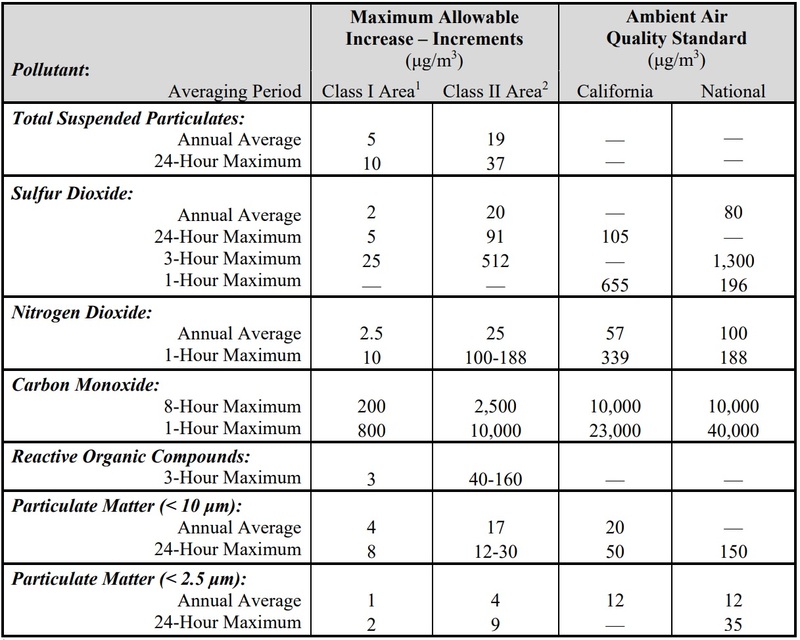 The table below displays the applicable ambient air quality standards and increment thresholds for AQIAs performed for projects in Santa Barbara County. Email the District at [email protected] to confirm the modeling requirements before submitting an AQIA for your project. 1 See the District’s AQIA: Class I Area webpage for more information.